This is a recipe from a recipe blog called "The Screwed up Texan". She says they like things spicy in Texas, I didn't think the recipe was spicy enough, so I adjusted it slightly. Guess I'm the Screwed up Louisianian. If you make these, you will be pleased. They are AWESOME! I used 48 mini cucumbers (4 packs) that I get at Sam’s, for this recipe. When you put the cucumbers, onions, garlic, and peppers in the pickling brine, it will look like there is not enough brine. There IS enough, you just need to give it time to heat up and the brine will cover all of the vegetables. 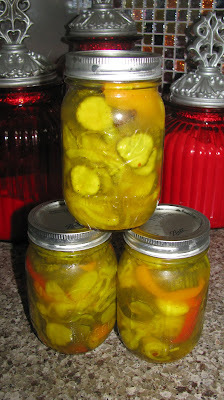 This is not a canning recipe; therefore the pickles MUST stay refrigerated. You can go through the process of canning them with a waterbath, but this recipe did not call for that step. This recipe makes 10 - 12 pints of pickles. The onions and the bell peppers are just as good as the pickles. I put everything in the jars. If you want just pickles, then only jar the cucumbers.